Tuscany meets the caribbean in this entertainerâ€™s dream pool home at the end of a cul de sac in the prestigious gated peninsula. The dramatic towering entry leads to the flowing open floor plan graced with travertine and marble pathways. Custom built-ins grace the office. The beverage center features a wine and drink fridge, coffee station, and granite counters. The 6 seat island faces the gourmet kitchen with custom cabinetry, center island, two refrigerators, and walk in pantry with full size freezer and ice maker. The open family/media room has an inset tv wall, built in av equip & marble fireplace. 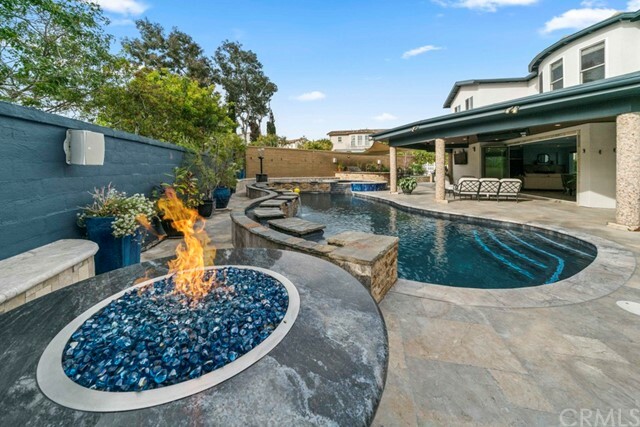 Sweeping glass doors open to the custom designed entertainment paradise with covered patio with heaters, av equip, custom bbq backed with rose bushes, & seating areas around the 13 spillway saltwater pool & spa. The master suite features a sitting area, custom walk in closet & bath with marble shower, dual marble vanities, & air-jet tub. The large loft/office has custom built-ins & a murphy bed. The two front bedrooms share a balcony facing the cul-de-sac. Enter the side courtyard thru 14 ft doors to the tiered organic garden with citrus & avocado trees. The downstairs bedroom has an adjoining bath. Major systems include smart home lutron i function, cat6 wiring, water filtering, 2 tankless water heaters, & 220 charging station. This truly private and special home is a short bike ride to the beach, the pier, the thriving downtown area and seacliff country club golf course. For more information or make an appointment to see property ID OC19084627.